Have you ever looked at something and thought "There is no reason in the world that this should be good" and even still, it is? Every now and again I see art that catches me by surprise, not because it is good but because, by all accounts, it should be bad. 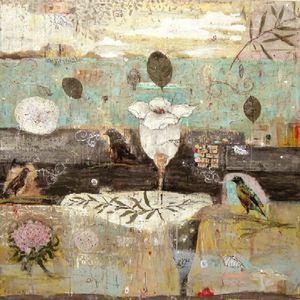 Think of thick paintings that utilize subdued color, images of bird and flowers, as well as collaged elements and sparse linear aspects, doesn't sound too great does it. Well, how wrong could I be. Nothing would of prepared me for the work of Marti Somers which is on display for the next three weeks at Addington Gallery in River North. Marti has a grasp on her materials and what she is communicating. These paintings are light, although the process in which she is using to arrive at them is far from that. Soft edges and grayed color float on the surface and I haven't the slightest idea why these paintings aren't just falling apart. They invited me in and I was surprised to spend a few warm minutes with them, the whole time thinking, "These should be bad, but they're not". If you get a chance, check out this show, it is rather impressive, and if you have any idea why it all works, please, let me know.